In mid-March and everyone is in the middle of their tying season. But for me bass season is right around the corner when my local reservoir opens for fishing. If there is any ice on the water they won’t let us launch boats or float tubes but we can still fish from shore. They still need to launch the Rangers boat and place the Off Limits buoys. Like everyone else I am stocking up on flies so that I won’t have to tie during the middle of the season. I also know though that I need to make sure all of my equipment is in top shape and ready to go especially my float tube, rods and reels. I’ve included a short tour of how I have my float tube rigged and some of the reasons behind the equipment I use. My tube is setup for stillwater fishing and for chasing bass and trout. I love this tube. I have fished it for over 10 years and I put a minimum of over a hundred days on it each year. The best thing about it is that it keeps my okole out of the water so that I don’t get as cold in the early Spring. I also love it because it fits perfectly in the back of my Subaru Forester. I can have it fully inflated and completely rigged. I just pull it out of the back, place my rods in their holders and launch from the side of the ramp in no time at all. It never fails. 95% of the fishermen launching from the ramp have under inflated tubes. I always offer to check the air pressure of their tubes and also offer to help them to top it off. First off it is safer to fish from a properly inflated tube. Also, you can travel faster with a properly inflated tube because there is less surface area touching the water. Having a properly inflated tube also allows you to fight fish more effectively. When you are fighting a 5 lb. smallie the last thing you want to do is to fight your tube to hold position in the wind. I also admit that the last thing I want to happen is for someone to get hurt just because their tube was under-inflated. I have seen guys that looked like they were wearing a life jacket because their tube was so under-inflated. I have had all of the rest and they all work but sooner or later they break down. This thing is a beast and calls for a bit of kane but well worth it. Because of the size of the barrel/hose this fills my float tube in a hurry. The o-rings are easily replaced and maintenance is minimal. I never loan this thing out. Rods – Sage 6wt and 4wt. When I started targeting bass I was told I needed to fish an 8wt. I stuck with my trout gear and haven’t had a problem. The reason for the 8wt. was to keep the bass out of the weeds and structure. If you know how the fish is going react once you set the hook you can anticipate how they are going to behave. You know the first reaction of a largemouth is to drive to the bottom and wrap you up in the weeds. So you need to gain back as much of that fly line that you have out there to control him on a shorter leash. Once you have his head up he is pretty much done. Smallies are a different matter. There is just no give up in that fish. He will fight on the way out. He will fight on the way in. He’ll fight you in the lap basket and on the way home. He’ll even fight you in the fridge if you bring him home. Once part gaining back some line it is still not over. You know as soon as he sees that net, then the real fight starts. Let him fight that expensive drag system and rod that you bought. Left too much line out? Better get to retrieving all that line and hope it doesn’t foul. There are some really fine line baskets out there but most of them are too deep for a float tube. The lap basket that came with my float tube works but does not keep my line untangled as well as my homemade one. The basket I have is 4″ deep and just about as wide as my tube. The lip is curled over so that I can comfortably rest my wrist and reel on its rim. I have mounted several oversized knitting needle tips in the bottom to help keep my line from fouling. In the cold water of the spring this is really important. Even though I stretch my line before fishing my fly line still has a bit a of memory which makes it easier to foul. I have to say the new lines that Rio released a couple of years ago are much better when it comes to memory especially with their full-sink and intermediate lines. You will notice that the needles closer to my casting hand are shorter so that I don’t bang my reel against them. I like to cast as much line out there as I can so that my fly stays in the feed zone as long as possible. There is simply nothing better for someone on a float tube. One day a compadre of mine and I were kicking to the far corner of the reservoir at about the same rate. I got there about 50 yards before him and I wasn’t as worn out as he was. They are just simply more efficient at moving water. Once again, a bit of kane but well worth it. 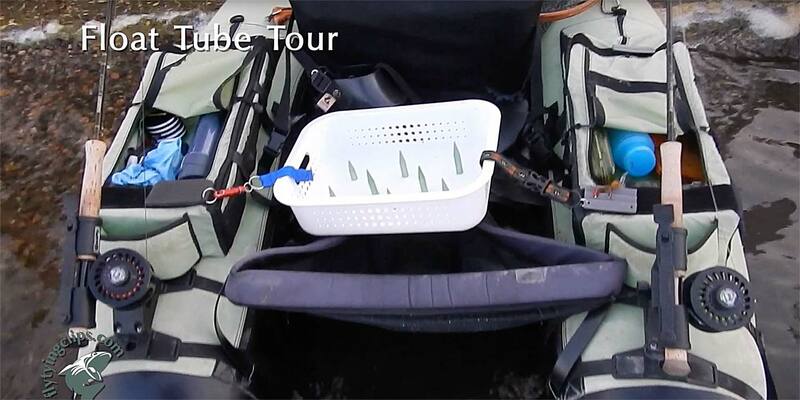 This entry was posted in Fly Fishing Gear, Fly Fishing Tips & Technique, The Hot Ticket and tagged Float Tube Tour: Video by Louis Cahill. Bookmark the permalink. Whose rod holders are you using.